Culross Abbey Church stands on the north side of the ruins of Culross Abbey, on a hillside above the village of Culross. This is an unusual and exceptionally interesting church with an unusual and extremely complex history. 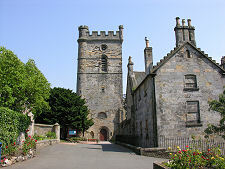 A description of Culross Abbey is given on our Culross Abbey Feature Page. Culross Abbey Church started life, as the name suggests, as the abbey church for the Cistercian abbey, which was established here in 1217 and developed over the following centuries. Significant parts of the church on view today owe their origins to the 1200s. By the late 1400s, the abbey church comprised a nave and a chancel and extended considerably to the west of the building you see today. At about this time, in common with other Cistercian abbeys, the abbey began to focus much more on the worship of its monks, and much less emphasis was placed on involvement with (and provision for) the local community. 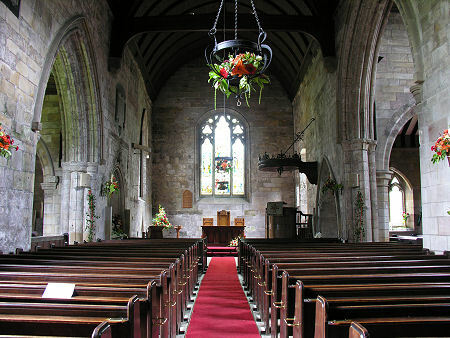 The result of this was that the nave was considered surplus to requirements. 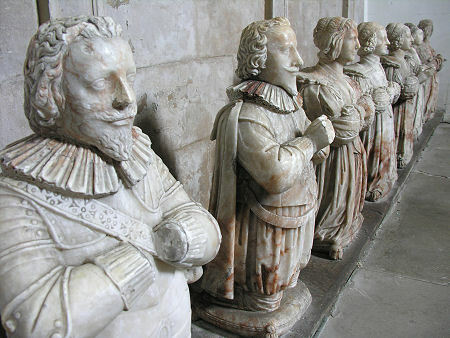 The abbot at the time was Andrew Masoun, and in about 1500 he oversaw the demolition of most of the nave, though parts of the south wall, which also served as the north wall of the cloister, survived. Abbot Masoun improved on what was left by building an 84ft tower immediately to the west of the surviving choir: in effect over the east end of what had been the nave. 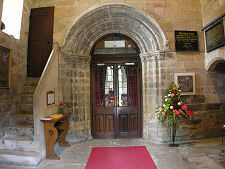 It seems that he moved the original west door that once led into the nave so it could serve as the west door into the new space in the base of the tower. The Reformation of 1560 swept away Scotland's abbeys. 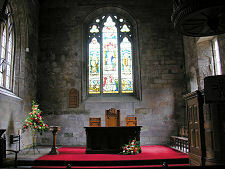 The abbey church at Culross began to serve as the parish church, a process that was given full legal status in 1633. 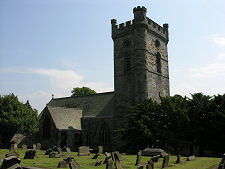 The church was renovated and remodelled in 1824, and a further comprehensive restoration took place under the guidance of the architect Robert Rowand Anderson in 1905. Entry today is through the base of the tower. 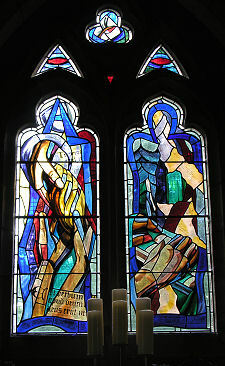 The church itself comprises four arms of almost equal length, a result of transepts that are only slightly shorter than the east-west arms of the main body of the church. This gives the church much more interest and complexity than you might expect from a building of its size. Extending from the north east corner of the north transept is the Bruce Vault, built in 1642, which must be one of the highlights of any visit to the church. 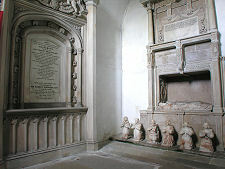 The large memorials on view in the vault are impressive, with that to Sir George Bruce and his wife especially impressive. The most remarkable feature must be the eight kneeling statues, representing the couple's children as adults, lined up in front of the memorial. The church is full of fascinating detail. 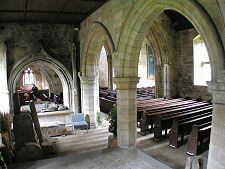 An arch linking the nave with part of the north transept is home to the stone effigies of a knight in armour and a lady, both defaced during the Reformation. 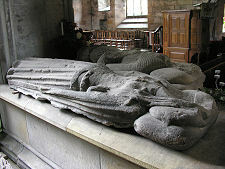 These remember John Stewart of Innermeath, Lord of Lorn, and his wife, and were originally placed here in 1445. 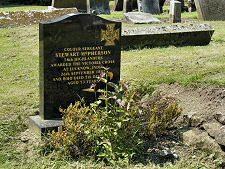 Elsewhere, an oval brass plaque notes that the heart of Edward Lord Bruce of Kinloss is believed to have been buried nearby. It seems that Lord Bruce came second in a duel fought with swords with Sir Edward Sackville in Holland in 1613. 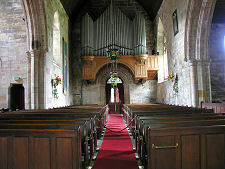 Tradition suggested that although Lord Bruce had been buried in Holland, his heart had been buried at Culross Church. A container believed to have held his heart was found in 1808 and reburied in the church. The graveyard at Culross Abbey Church is home to a number of interesting and fairly old stones, though pride of place goes to the black marble gravestone of Colour Sergeant Stewart McPherson, who won the Victoria Cross at Lucknow in India in 1857 but survived to see out his days in Culross where he died, aged 73, in 1892.